Are you looking to install a new pool in your backyard but need to stick to a budget? Has your old filter finally given up, leaving you with an unexpected pool expense? Wouldn’t it be nice if you could find a low-cost filter that works well for your pool? If you’re searching for cheap pool filters and pumps, you’ve come to the right place! Last update on 2019-04-23 at 20:16 Product prices and availability are accurate as of the date/time indicated and are subject to change. Any price and availability information displayed on [relevant Amazon Site(s), as applicable] at the time of purchase will apply to the purchase of this product. Why Buy a Cheap Pool Filter? In this article, we’ll provide you with tons of information about the best low-cost pool filters, pumps, and filter systems you can find. We’ll give you in-depth product reviews and tell you the pros and cons of each one, so you can weigh your options and find the filter that best suits your needs and your budget. Cheap swimming pool filters aren’t all bad, and we’ll make sure you know which ones can give you the most bang for your buck. If you’re interested in learning more, read on! Whether you’re searching for a low-cost filter for one of these reasons or for any other, we’ve collected a list of some of the best options available. Check them out below and see for yourself what great products you can find even when you don’t want to spend a lot of money on them. Cheap pool cartridge filters are fairly easy to come by, but sometimes, you might end up purchasing one that’s no better than the low-quality ones that come as part of box deals with pop-up pools. If you’re hoping to upgrade from one of these kinds of filter systems, check out the products we have listed below. All of these filters and pumps prove that you can easily get a cartridge filter system put together in your backyard without having to spend too much money to make it happen. Remember to factor in the cost of cartridges, too. The Intex Above Ground Pool 530 gal/hr Water Filtration Pump is an excellent low-cost pump that’s sure to help you get started no matter what kind of pool needs you might have. This little pump can filter a significant amount of water every hour to provide you with clean, clear swimming no matter what might come its way. Although it’s a small pump that might not be suitable for very large pools, it nevertheless can get the job done right when you pair it with the proper filter and the right size pool. Bring one home today and see how easy and affordable it can really be to get your filter set up. You can easily get this filter installed and running within about 30 minutes of opening the box. The filter is small enough to place just about anywhere easily. If you have a koi pond or a large aquarium, you can even get some use out of this filter for that as well! In some rare cases, the filter cartridge may not fit correctly into the pump and may need to be altered or replaced. The filter pump is a bit louder than many of its competitors. You may need to purchase different hoses and connectors for the pump, depending on your existing hardware. Whether you have an Intex pool or not, you can get a lot of great use out of this Intex Easy Set 530 Gallon Swimming Pool Filter Pump. This pump is designed for use with pop-up Intex pools, but that doesn’t mean you can’t make it work for smaller above-ground pools as well. Although it’s not as powerful as many of its competitors, it can still help you keep your water flowing and sparkling all summer long, provided you use it with an appropriately sized pool. Be sure to consider this little pump when you’re putting together your filter set. This pump comes with a long power cord to make it easy to place it anywhere around your pool. ​The pump is very popular and continues to be purchased by many happy customers. ​You can get a little heavier use out of this pump than you can with many of the other low-cost cartridge pumps on the market. If your pool doesn’t have a hose connection built in, you’ll need to make some alterations before you can use this pump. Without proper usage and maintenance, the filter will break down easily due to its smaller size and capacity. The pump usually only has a lifespan of two to three years before it will need to be replaced. This handy little Pool Filter Cartridge Pump is ready and waiting to become a part of your affordable backyard pool setup! This filter pump can be used with either a pop-up pool or an above-ground pool, and since it’s universally interchangeable, you can use it no matter what brand your pool system might be. You’ll need to purchase the filter itself separately, but with this low-cost pump, you won’t have any trouble fitting both of them into your budget with room to spare. If you’re putting together your own filter system, you can’t go wrong with this pump as a part of it. You can quickly and easily install this pump with no trouble and with no additional assistance. ​The pump can clean up a small pool in about one 24-hour cycle. ​This is a common pump that comes with many pools, so it’s designed to work well even for a beginner. This small filter pump is not an upgrade from most pool setups right out of the box. The pump doesn’t come with everything necessary for a full filter system, so you’ll have to spend extra for the other bits and pieces. This pump is lightweight and may break or become damaged during inclement weather. Are you looking for a filter pump setup that’s ready to be used right out of the box? Would you like to bring home a box set of items that can help you save even more money overall? When you’re setting up a pool on a budget, it pays to purchase in bulk. And with the Intex 530 GPH Pool Filter Pump and 6 Type A Cartridges, you’ll be able to start your pool setup off right with everything you need to operate it all summer long. 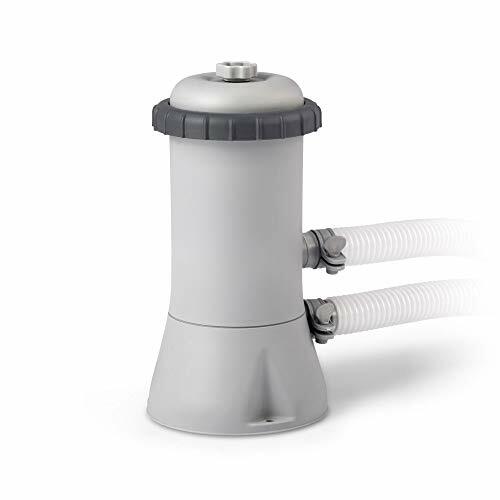 This filter pump is strong enough to handle most small pools, and the included filters can be used over and over again with regular cleaning and maintenance. This is a universal pump that works well with many existing pool products. 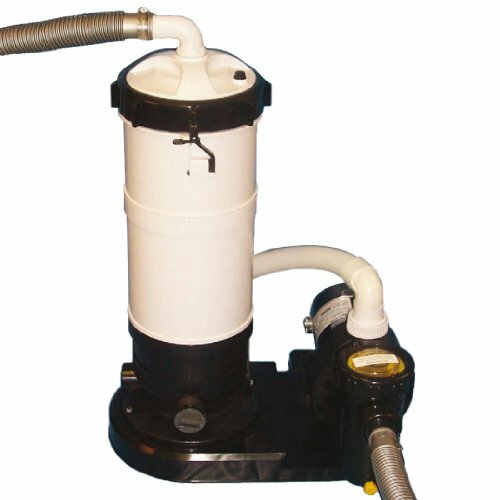 ​You can easily install this pump on your own without any prior plumbing or pool knowledge or experience. ​The included filter cartridges are all durable and long-lasting. This pump may take a few days to completely clear up your water. The pump may be too small to be beneficial to anything but the smallest size pools. You may need to replace this pump frequently because of its weaker size overall. This durable cartridge filter is just what you need to get your mid-sized swimming pool up and running in no time! This filter has a flow rate of 15000 gallons, which is considerably higher than many of the other low-cost cartridge filter products on the market. It comes with a built-in pressure gauge as well as with a durable base to make placement and regular maintenance very easy. 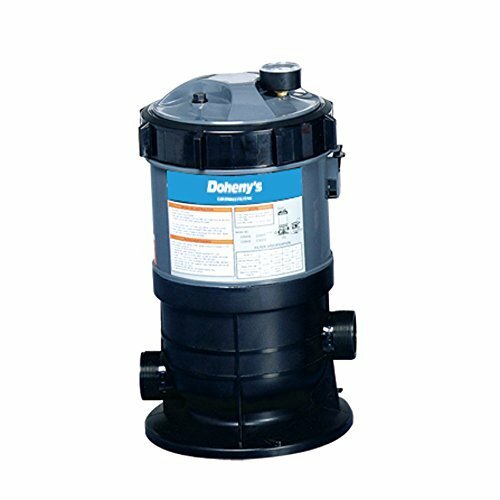 You’ll never again have to struggle with cleaning your filter replacements when you have a Doheny’s Cartridge Filter as part of your regular pool setup! This is a great low-cost filter that works well with many of the low-cost cartridge pumps available as well. ​The filter is small enough for simple placement but strong enough to handle many mid-sized pools. ​You can use this filter with a pop-up pool or with an above-ground one. This filter is not a name brand that generally fits with most pool systems universally, so there’s a chance it won’t work with your pool. The filter doesn’t come with any of the required hoses, cartridges, or hookups needed, so you’ll have to purchase them separately. The filter’s pressure gauge may crack and stop working easily. When you’re shopping for cheap sand filters for pools, you may be a little surprised by the prices you encounter. What constitutes “cheap” in the world of cartridge filters is pretty much nonexistent when it comes to sand filters. 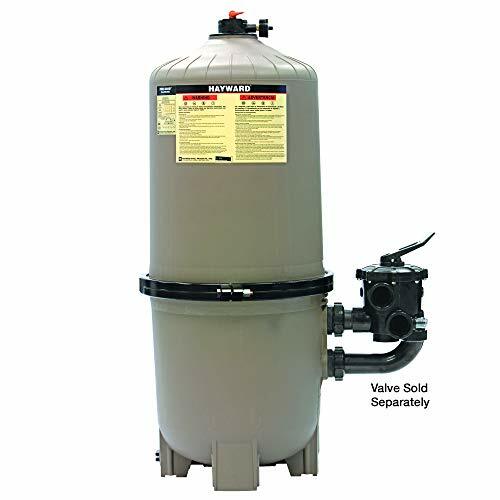 With that said, however, you can still find good-quality sand filters for a fraction of the cost of some of the bigger name products out there. If you have a little more to spend on upgrading your pool filter and you’re ready to make the jump to a sand filter, we’ve got plenty of products to help you find the perfect balance listed below. Although sand filters tend to be much more expensive than cartridge filters, if you’re looking for an affordable sand filter to help you set up your pop-up or small above-ground pool, this is a great option. The Rx Clear 8” Inch Patriot Above Ground Sand Filter for Intex/Pop-Up pools features a durable molded plastic design and its own built-in base to keep it safe and secure no matter where it needs to be placed. It comes with a four-way valve included to make backwash and cleaning much easier, and it’s built to withstand several years of use and plenty of exposure to chemically treated water without showing any signs of damage. This filter comes with all the hoses and connections you need to set it up right away. ​The four-way valve is included with this filter, which saves you money on having to buy this important piece. ​The filter is very easy to install and set up even if you don’t have prior experience. Aesthetically, this pool filter might be a little less pleasing than others, so if you’re looking for something that blends into the look of your backyard, you might want to choose a different option. The filter’s pressure gauge has been known to arrive cracked or damaged. In some instances, the drain cap may easily crack and cause a leak at the base of the filter. 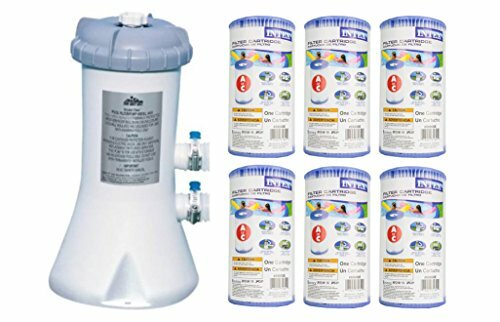 If you have an above-ground swimming pool and you’re looking to upgrade from the cartridge style filter that came with it, be sure to check out the Rx Clear Liberty 14 Inch Sand Filter. This is a sleek little filter that can give you all the benefits of a much more expensive sand filter without having to break the bank to do it. It’s built out of corrosion-proof plastic and features a molded base for safe positioning anywhere in your yard. Although this filter is designed for use with Intex pools and any steel frame pools, you can also use it with round and oval above-ground pools easily. This filter gives you a lot for the price and comes with everything you need to get it set up and running. ​This is a great universal filter that will work with just about any existing pool hardware. ​The filter only requires 25 pounds of sand at a time, which makes it an affordable option. If you use your pool very regularly or you have very hard water, this filter might not be strong enough to get it clean. The included pieces have been known to be broken upon unboxing in some instances. The filter may develop cracks along the seam lines over time and will need to be replaced if this happens. The Rx Clear 12” Inch Patriot Above Ground Sand Filter is the perfect solution for any pool owner looking to try out sand filters for the first time. Whether you have a pop-up pool or an above-ground smaller pool, this filter is sure to be the perfect option for you. Bring one home and see how easy it is to use and maintain it, especially in comparison to your existing cartridge filter. With this filter as part of your regular pool repertoire, you’ll never again have to worry about whether or not your water is really getting clean. This filter comes with all the parts you need to get it set up and running right out of the box. ​Because it’s designed to work with Intex pools, this filter can also be used universally with most other backyard pools too. ​The filter only requires once-a-month maintenance and once-a-week backwash cleaning to keep it up to par for years. The seam lines on this filter have been known to be a little weak and may split over time. If you aren’t careful, you can over-tighten the lid and cause stress fractures on the filter tank. The included hookups may not be the right size for your pool, especially if you have an older system. The Intex Krystal Clear Sand Filter Pump for Above Ground Pools is an excellent filter system that comes with absolutely everything you need to start filtering your swimming pool right away. The filter itself is a powerful sand filter that can keep your water flowing smoothly and cleanly with almost no effort, and the pump is strong and durable. The system comes with all the hoses and connections required to set it up, and it even comes with a timer, pressure gauge, and six-way valve, all of which can help you maintain and clean your whole setup much easier. It only takes about 20 minutes once a week to backwash and clean this filter. ​You won’t have to add more sand to the filter for approximately five years, provided you operate it correctly. ​This is an incredibly popular filter setup that customers continue to be very happy with time and time again. Depending on your pool setup, you may notice a lot of sand washing into your pool through this filter. In rare cases, the filter tank has been known to arrive with cracks or damage from shipping. The filter has been known to develop a humming sound that may be irritating to some pool owners. Are you looking for a low-cost option that’s a little larger and more powerful than some of the other sand filters listed here? Do you find yourself wishing for a higher-quality sand filter tank than the ones you’ve already seen? 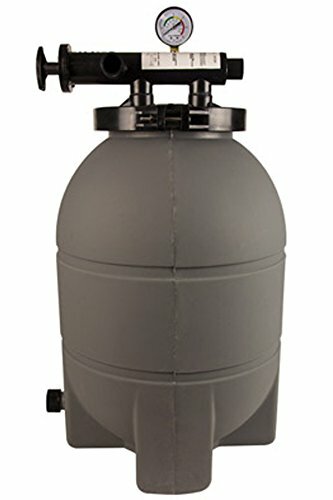 If so, and if you have a little more in your budget to spend on your filter, then the Swimline 71400 Sand Filter Tank with Valve/Base may be just what you need. This filter is a large tank that can be used in conjunction with several different filter setups to give you plenty of excellent filtration from the first time you turn it on. This is a large tank that can hold a lot of sand and give you much more filtration for larger pools. 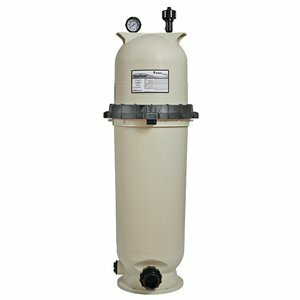 ​This sand filter can be used with above-ground pools with no need for alterations. 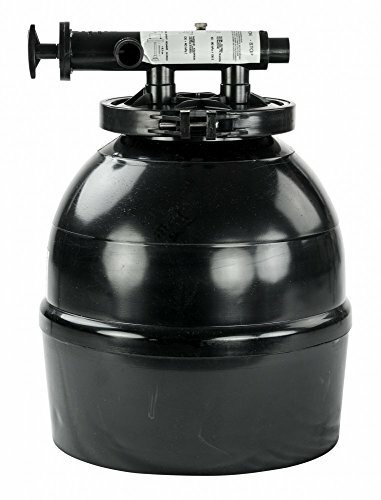 ​The tank comes with the six-way valve that makes it easy to clean and maintain the whole filter system regularly. 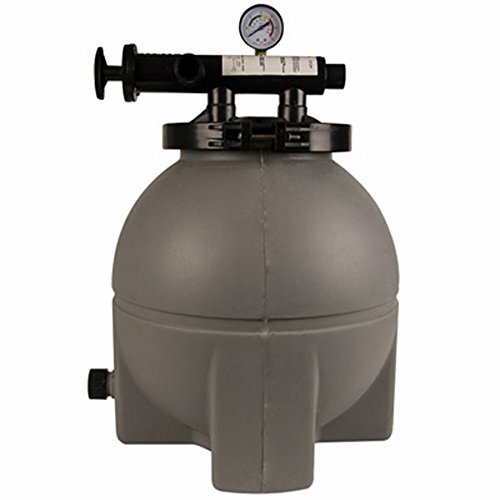 This is a filter tank with a valve and base only, and it does not come with any internal pieces or external hookups needed to install it. 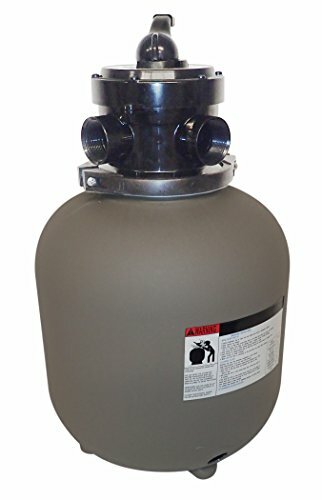 This tank may be more difficult to install than some of the other filters listed here. This tank is not compatible universally with backyard swimming pools, unlike some of the others on this list. Cheap pool filter systems come in a variety of different shapes, sizes, and styles, and you can find proportionally low-cost DE filters when you know where to look, too. These filters tend to run quite a bit more than cartridge filters and even a little more than sand filters, but they can provide you with a lot more filtration overall. They’re great for use with bigger pools, so if you can find a little more in your budget, it might be well worth the extra cost to choose a DE filter when it’s time to upgrade. Remember that you need to consider the cost of the diatomaceous earth when using these filters, too. With the Hayward EC301540ESNV Perflex Extended-Cycle 40 GPM DE Filter Pump System, you’ll be well on your way to the cleanest swimming experience you’ve ever had right in your own backyard. This filter system is small but very powerful, and it’s sure to give you all the excellent water filtration you’re looking for regardless of the size of your pool. The filter and pump are both made of durable plastic that’s built to resist corrosion from frequent exposure to the elements and to chemically treated pool water, and the included base is sturdy enough to keep your filter in place no matter what might come its way. This filter is much more powerful than many sand and cartridge filters available on the market. 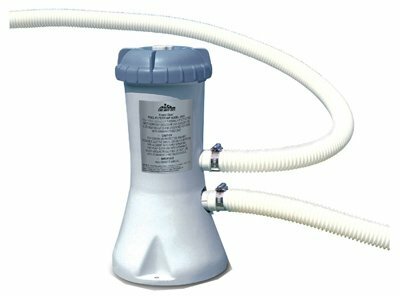 ​Customers who have purchased this pool pump setup have reported using it for upwards of 10 years without any trouble. ​The filter comes with a timer, hoses, connectors, and the base as well as the filter and pump, so all you’ll need to buy is the diatomaceous earth. In some cases, larger pieces of debris may make their way into the internal workings of this filter and cause damage. The flow rate of this filter is lighter than it is in some sand and cartridge filters, which may not work well for all pools. Since you will need to add more DE to the filter every week or so, this can be an ongoing expense. 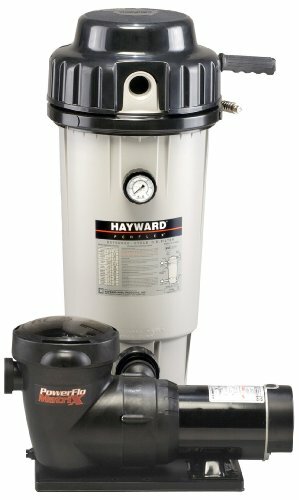 When you need a powerful filter that can handle a lot of use in your swimming pool, you need the Hayward EC50C92STL Perflex 1-Horsepower Extended-Cycle DE Pool Filter. Although this is a small filter in terms of size, it makes up for it significantly by filtering a lot of water in a short amount of time. Since it comes from the Hayward company, this filter is built to last, and you can be sure of its quality as well as the incredible customer service that goes along with every Hayward brand product. When one of these filters as part of your pool’s setup, you’ll never again have to worry about filtration issues at all. Once you have this filter installed, you can keep it up and running for seven to ten years with only basic maintenance and regular cleanings. ​The filter doesn’t require as much DE as traditional DE-style filters do, which makes it more eco-friendly and affordable, too. ​When you purchase this system, you’ll have everything you need to get it set up right out of the box except for the DE itself. The included laterals inside the filter tank have been known to break easily, especially with frequent use. The included hoses may not be the right size to connect to your existing pool hardware, especially if you have an older model pool. You cannot use this filter with a pop-up pool. Do you already have a pump in place and need to replace the existing DE filter? Are you looking for a powerful little filter that can go along with a strong pump you plan to purchase? 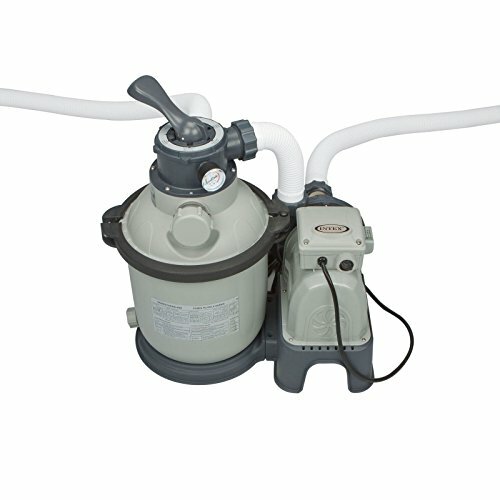 If you’re putting together your own filter system or replacing a part of yours that isn’t working, consider this 1﻿﻿.5 HP DE Filter Pump for Above Ground Pools. This is a standard DE filter system that’s built of corrosion-proof materials and comes with a built-in base for safe use and positioning. It only requires 2.5 pounds of DE to get this filter up and running, and because of its easy-to-use design, you’ll have no trouble opening it for regular cleaning and replacement of the DE that gets used up over time. 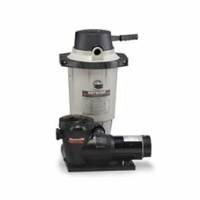 This is a strong filter that has a 1-1/2 HP pump, which is a little more powerful than some of the Hayward brand products listed here. ​This filter comes with a hair catch which can help stop larger pieces of debris from making their way into the inner workings of your pool. ​This is a self-priming filter that doesn’t require a lot from you after the initial setup. This filter isn’t made by a well-known brand name like Hayward, so some pool owners may be picky about this. The filter doesn’t come with everything you need to get started, and you’ll need to purchase a pressure gauge as well as hookups and hoses. This filter may not be able to be used with all existing filter pumps and other hardware. The Pentair 188615 EasyClean Fiberglass Reinforced Polypropylene Tank DE Pool Filter is built to last. This filter is designed to work with just about any above-ground pool, and because of its size and capacity, it can handle a high level of weekly use in your pool with no trouble. It’s a very user-friendly filter that’s easy to operate, install, and clean when the time comes, and since it comes from a brand name company, you’ll be able to contact customer service for advice and assistance if you should need any additional help. This filter may be too large for use with some above-ground pools and is too large for pop-up pools. ​This is not an eco-friendly DE filter, so if you’re worried about cutting back on the amount of DE you use, you might want to choose another option. ​This is a powerful filter that can handle a larger pool with no trouble. This is not an eco-friendly DE filter, so if you’re worried about cutting back on the amount of DE you use, you might want to choose another option. This is a larger filter that may be difficult to place in your backyard depending on the space you have to work with. With the Hayward DE3620 ProGrid 36 Square-Foot Vertical Grid DE Pool Filter in your setup, you’ll have incredible filtration in your pool no matter how often you use it. This filter is tough and rugged, and it can withstand tons of use year after year. Installing it is a simple process, and keeping it up and running every time pool season rolls around is just as easy. This filter can handle a lot of water per cycle, which means it’s great for use with larger swimming pools. Although it isn’t designed for in-ground pool use, you can use it with some of the biggest above-ground pools available. It comes in a variety of other sizes, as well, but if you’re looking to stick a budget, the 36 square foot filter tank is probably your best bet. This is one of the most popular DE pool filters on the market and has been purchased by many happy customers who are pleased with its design and functionality. ​The filter comes from the Hayward company, which is a leading name in pool filter products. ​It’s easy to set up this filter and install it regardless of your prior experience or existing pool hardware. This is the most expensive filter on our list, so if you’re shopping on a budget, it might be too pricey for your needs. This filter requires considerably more DE than the others listed above, which may also increase your operating cost over time. Since this is a more powerful filter, it also requires more electricity to run it. Pool filter systems come in many different styles, but when you start shopping for them, you’re likely to realize pretty quickly that “cheap” is not a word that describes a lot of them. It seems like most pool owners are concerned with buying the biggest, flashiest, and most expensive filters and pumps available, so why would you want to consider buying a cheap filter instead? There are a lot of reasons why going the cheap route might be the best option for you. Although there are a few potential issues to keep in mind when buying a cheaper product, for the most part, if you know where to look you can find great deals on excellent filters that work just as well as the flashy ones. You have a small pool or one you don’t use very often. If you’ve got a little swimming pool, you don’t need a big filter to take care of it! Even if your pool is a permanent above-ground fixture, if it’s just a small setup, there’s no need to spend a lot of money on your filter. The same is true of pop-up pools, which can usually get by with very affordable filters. If you have a mid-size pool but it doesn’t see a lot of use, chances are good you can cut costs with your filter as well. You weren’t expecting the expense of a new filter. Unfortunately, pool problems arise sometimes when we least expect them. If your filter has quit working right in the middle of the pool season and you don’t have enough money set aside to replace it with an expensive alternative, why not try one of the cheaper ones you can find? There’s no harm in buying a cheaper filter, even if you’re replacing a broken-down expensive one. You might even find that the lower-cost option is a much better filter than the one you already had! You want to try a new type of filter without buying a pricey one first. This is normally true for anyone looking to upgrade from a cartridge style filter to a DE or sand filter instead. If you’re thinking of going to one of these options but you don’t want to spend the money on a bigger and more expensive one from the beginning, you might want to try a cheap one for now and see what you think. This can give you several years to save up for a different one if you choose, and once again, you might find that the low-cost filter does the job just as well as its pricey counterparts. Either way, you’ll have better filtration for many years without having to come up with a lot of extra money to give it a try. Best filter system: Hayward EC301540ESNV Perflex System. This system has everything you need and won’t end up costing you a lot extra when you have to buy a bunch of add-ons. It’s a DE filter, so it’s sure to be strong enough for you no matter what type of pool you want to use it with. Although you can’t use it for a pop-up pool, it’s a great solution for any other above-ground setup you might have. It can last you up to ten years with no trouble. Best filter: Rx Clear 12” Patriot Filter. Sand filters are the way to go for just about any pool setup, so unless you’re specifically looking to upgrade all the way to a DE filter or you prefer to stick to cartridge filters for the future, give this one a try. It’s big enough to handle most above-ground pools but small enough to work with pop-up pools too. It’s an all-around excellent filter choice that’s easy to use with any preexisting pool hardware. Even if you don’t choose one of our top recommendations, you’re sure to get tons of great benefits and plenty of clean water to swim in from any of our listed products. Whichever one you pick, it’ll help you create the perfect backyard pool experience for you and your whole family.